After a while I came up with an idea of a watch that uses balanced ternary system. As it suggested by its name, this system uses powers of 3: 0, 3, 9, 27 etc., but unlike normal numeral systems it does not use for coefficients non-negative numbers 0, 1, 2, n-1 (n being the base), but instead uses -1, 0 and 1. So, 0 is 0, 1 is 1, 3, is 3, 9 is 9. What about 2? 2 is 3-1, or 1*3^1 + (-1)*3^0. 4 is 3 + 1, or 1*3^1 + 1*3^0. I decided to use the 12:5:9 format and started my design with three rows: one for the hours 1-12, one for the tens of minutes and one for the single minutes. Each row had numbers 9, 3 and 1, drawn with a blocky font, in white, black or contour (for coefficients 1, 0 and -1). Then I realized that there are 3 rows and 3 columns and after I draw a 3×3 grid, I decided to use the Tic-tac-toe game symbols and layout to indicate time. The coefficients -1, 0, 1 were replaced with symbols X, [empty symbol] and O. The right-hand column represents 1 (3^0), the middle one- 3 (3^1) and the left-hand one- 9 (3^2). If there is an O, this means that the column value (1, 3, or 9) is added. If there is a X – we subtract it (always 1, 3 or both – we don’t need to subtract 9 for our purpose of displaying time in 12:5:9 format). If the cell is empty – nothing is added / subtracted. The second row indicates the tens of minutes / tens of days. The third raw tells the single minutes / days. In the upper left corner there are two squares indicating the current mode: am, pm, date or game mode. 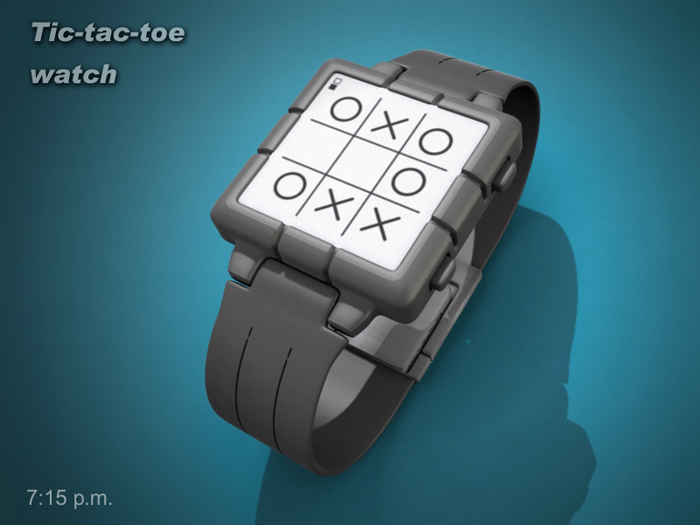 I suppose that this watch can be realized with an e-ink or LCD display. 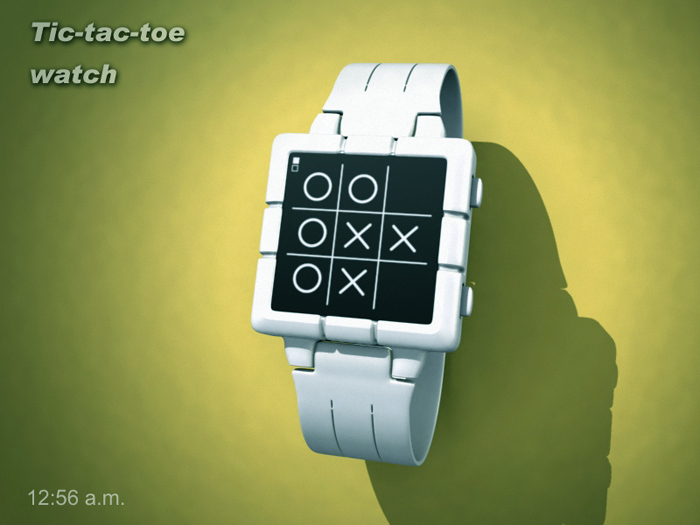 I don’t think a touch screen is needed, because even in game mode the two buttons of the watch can be used to navigate/set the board. 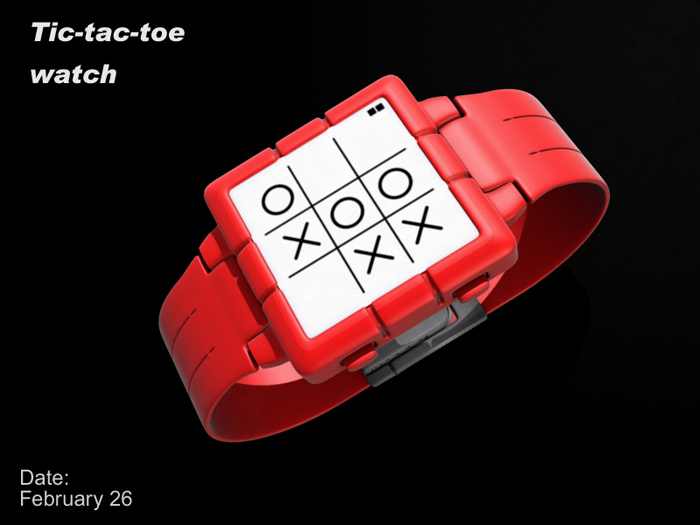 For the body and strap of the watch I used glossy plastic with simple forms that communicate the main topic – the tic-tic-toe grid. 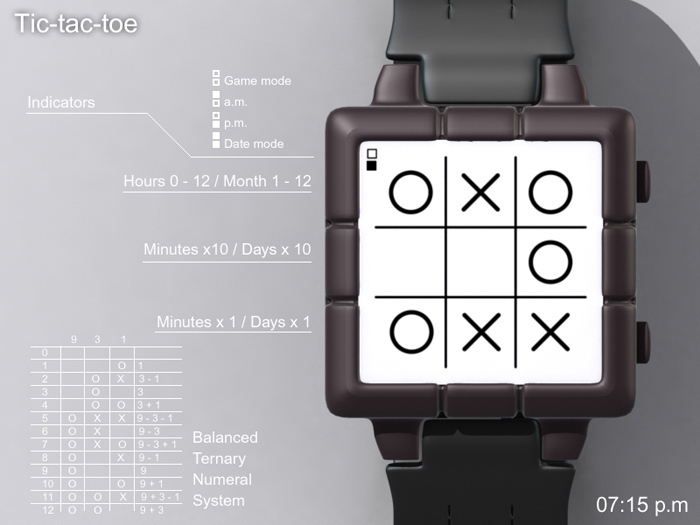 This entry was posted in Design Submissions and tagged 12-5-9, Binary, Concept Watch Design, cryptic, E-Paper, LCD Watch, noughts-and-crosses, puzzle watch, squares, ternary, tic-tic-toe, unisex, Watch Design Submission. Bookmark the permalink. Very creative. At first I just could not grasp what was going on, I just didn’t read carefully enough ~ but yes its really quite straight forward & not difficult at all. ‘O’ you add the number, ‘X’ you minus. Thanks for posting and commenting, Tokyoflash! Your explanation is really helpful. I like the overall look, using 12-5-9 on 3 rows, using unusual symbols instead of plus/minus & being able to play the game. Being used to the constant adding up of the binary system, I have a problem with alternating between adding & subtracting amounts. A note: the explanation on the 2nd picture should have been black / visible, not in white. at the first moment when I saw the long formulas for calculation, I thought: “Did he start his explanation with ‘something easier to read than normal binary’ ” ? but then I skipped forward to the example images and realized: ‘hey, thats not that difficult … actually quite simple’ with a bit of practice. as time telling is sort of weird and fun, I mostlikely would buy one. Thanks for your words, ObeliX. I’m afraid it’s my explanation that makes it hard to understand although it’s not at all. Tokyoflash demonstrated very well how to calculate the time. Galen, how did you figure this out? It’s brilliant! Thanks xiandavis, it’s just a compilation of ideas – an efficient numeral system and some popular symbols. Thank you for your comment , Peter! I understand your viewpoint. It’s quite natural, because the decimal numbers are so deeply ingrained in our minds, that we take them for granted. However I believe that after some use of binary, ternary and so on watches, the process of counting will be replaced with simple pattern recognition. This is be more likely to happen with 12-5-9 designs rather than 12(24)-59. After all we need to remember only 12 patterns! A very-very good and very simple twist on my Equilibrium ternary watch! Thank you, Galen. 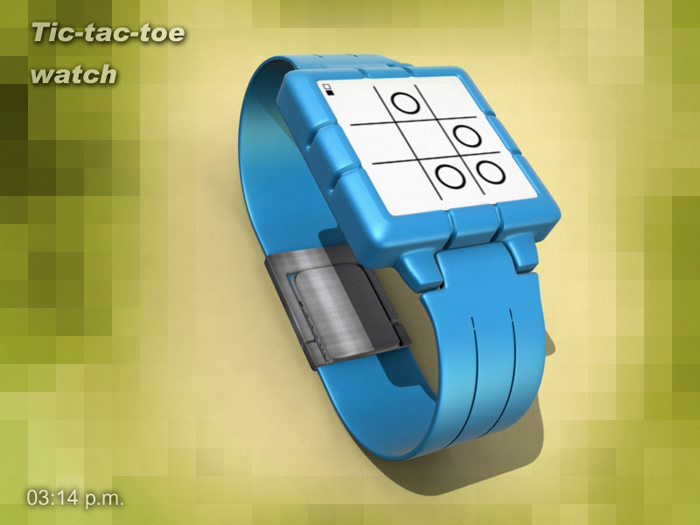 I am very happy to see another Ternary watch design here! I’ve sent in 7 versions (easier (using only 1-3-9), and “more difficult”) of this concept (Basic, 3Minimal, 3.14 and Mathreex, Dinamic, Halloween) on 2013. The best versions are the Mathreex and the Halloween. They are not published yet. Hi Robert and thank you for your comment! I learned about this numeral system from and old Soviet children encyclopedia. And yes, the concept was used to demonstrate weight measuring on a scales with unique scale weights (only one of each weight). So, you only have weights 1,3,9, 27 and so on, which you can put on both sides of the scales, not only opposite to the object you are measuring.